Godwin Pumps of America and Godwin Pumps Limited teamed up to meet an urgent need for a long-time customer in the United Kingdom. In one week, Godwin's Bridgeport, NJ and Quenington, England factories each built an HL6/TS-2 Dri-Prime pump and air freighted the more than 9,100 kgs (20,000 lbs.) of equipment to a gold mine in West Africa. A further pump from the Quenington factory followed shortly thereafter to handle flooding from heavy rains which were affecting mine excavation. The 275-horsepower pumps powered by Caterpillar C9 engines are used throughout the mine in dewatering applications which demand total dynamic heads of 120 metres (390 feet) and flows of 250 to 300 m3/hr (1100 to 1300 gpm). Having had previous experience with Godwin Dri-Prime pumps, the company that manages the mine placed an order with Godwin for pumps in anticipation of the rainy season. Godwin delivered. "Our customers are benefiting more and more from the combined resources of our two factories," said John Michael Paz, president. 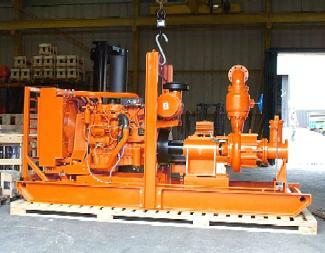 "Since the June 2001 acquisition of Godwin's Limited, we can offer even quicker delivery of large dewatering diesel pumps."